Roger Allam delivers a stunning performance – killingly funny and achingly sad – as the founder of this Sussex country house Mozartian Mecca. Roger Allam delivers this with spine-tingling magnificence and throughout captures Christie’s extraordinary mix of obduracy, uxoriousness and visionary zeal. Roger Allam, hilarious as a blustery Glyndebourne-goer in the new Alan Bennett/Nicholas Hytner movie, The Lady in the Van, is the intemperate, Wagner-loving Christie who delivers a wonderful speech about why people should jolly well dress up and pay lots of money, spend a day of their lives, to commune with genius and great art in perfect surroundings. Allam’s performance is wonderful: he makes Christie childishly consumed with optimism for his endeavour, naive to the rising Nazi regime. When he gets into his stride, arguing passionately for opera as the greatest and most sublime of all art forms, Allam hits all the right notes. A truly transformed Roger Allam — one of our finest and most versatile actors — stuns as Christie; barely recognisable with a nearly bald pate, his is a portrait of a particular kind of English eccentricity that rings utterly true. 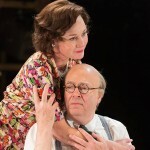 Roger Allam gives an impressively rounded performance as Christie, a mixture of endearing idiosyncrasy, peremptory patricianism and tender concern for Mildmay, played with diplomatic charm and practical common sense by Nancy Carroll. [Christie] is complex and contradictory, a bumptious, almost autocratic figure but also a gentle, public-spirited and determined man. Allam, sporting an egg-bald pate and squinting through circular specs, trousers pulled up over his belly, keeps him both likeable and ludicrous. For all his conviction, he’s blind to the limits of his knowledge: “I happen to be one of those people who knows what they’re talking about,” he snoots. The ghastly oil paintings in Rae Smith’s design suggest otherwise. 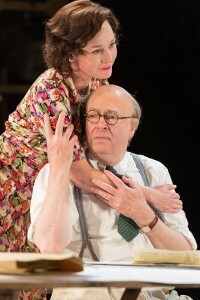 Allam – barely recognisable as the balding, paunchy John Christie – captures both the single-minded drive and the childish querulousness of Glyndebourne’s founder. The humour that dominates the earlier scenes all stems from Allam, gamely stepping up as the archetypal English eccentric – overwritten to the point of parody at times, but always anchored by an essential humanity that connects this material to the gentle tragedy of the ending.